The Cedar Hill Neighborhood Advisory Board and the City Council recognize two neighborhoods each year for special achievements. The awards are presented to the neighborhoods for their work towards improving the quality of life in their communities. 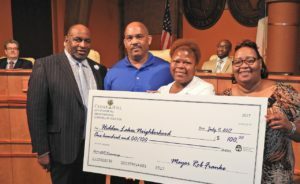 Cresthaven Village received the Premier Neighborhood Award at a recent council meeting, with Hidden Lakes neighborhood announced as runner-up. Neighborhood Engagement is a top priority for Mayor Rob Franke and the City Council. It is important that each neighborhood in the community exhibit the values established by City Council. Award applications are evaluated by the ability to demonstrate City Council’s Values within their neighborhoods. The Cedar Hill City Council values are: (1) People and Relationships; (2) Stewardship; (3) Highest ethical standards, behavior and integrity; and (4) Servant Leadership. The Cresthaven Village neighborhood is located near the corner of Pleasant Run and Old Clark Road. This quiet neighborhood currently is home to 91 families with plans for more homes to be completed by 2018. The neighborhood offers a retirement community in a beautiful, gated subdivision. The neighborhood is centrally located in close proximity to shopping, businesses and church activities. Many residents maintain a close working relationship with the City of Cedar Hill. They serve as volunteers on boards and the Citizens on Patrol program. Red strobe lights have been installed on each house as a special aid to the fire department. The lights can be activated to help emergency vehicles locate the house when responding in their gated community. The neighborhood has a dedicated group of residents committed to increasing its relations with other various organizations and businesses throughout the city. Cresthaven Village residents are frequent volunteers for the Taste of Cedar Hill, New 2 You, and the Cedar Hill School district. The Cresthaven Village neighborhood association is led by President R.C. Clack and the Board of Directors. The Hidden Lakes neighborhood is located in the southeast area of the City, a short walking distance from the Cedar Hill Recreation Center and the newly constructed Red Oak Creek Trail. This community includes 101 households, with convenient access to trails, parks, churches and retail shopping. Residents are committed to making the community and their neighborhood a great place to live. 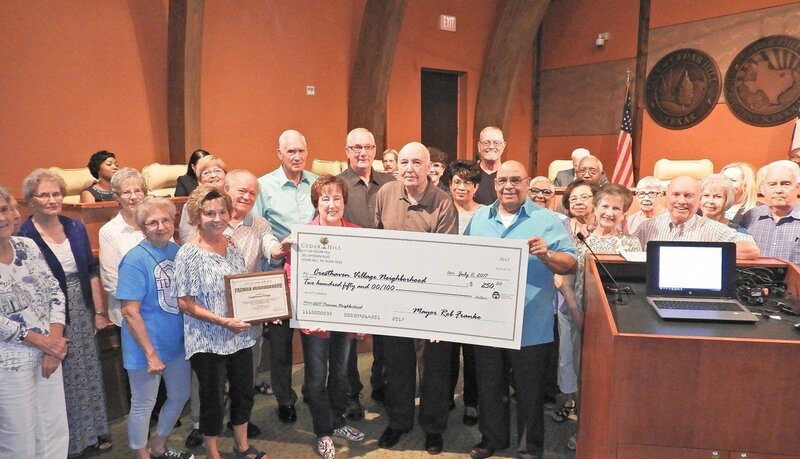 Hidden Lakes residents distinguished themselves in every award category with regular crime watch meetings, participation in National Night Out, progressive dinners and block parties. Steven Ridge serves as president of the Hidden Lakes Association.